Chelsea and England captain John Terry has undergone successful surgery to cure his troublesome back injury. But Blues officials have yet to reveal how long they expect the 26-year-old centre-half to be out of action. "The operation to remove a sequestrated lumbar intervertebral disc was successful," said a Chelsea statement. Chelsea have conceded six goals in three league matches without Terry and have fallen four points behind Premiership leaders Manchester United. The early indications are that Terry could return within weeks not months. But having sold both William Gallas and Robert Huth, manager Jose Mourinho has admitted the continued absence of Terry has left him short of defensive options. The Blues have already conceded 15 league goals so far this season - only seven fewer than they did over the whole of the last Premiership campaign. 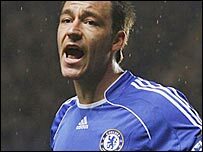 Terry's injury could also hit England, who are due to play Spain at Old Trafford on 7 February.